UF Health is designated as a Center of Excellence for myeloma, myelodysplastic syndromes and pancreatic cancers. The patient outcomes of the UF Health Blood and Marrow Transplantation Program are ranked among the top 2.5 percent nationwide. It is one of 20 core centers nationwide that comprise the NHLBI/NCI Blood and Marrow Transplant Clinical Trials Network. 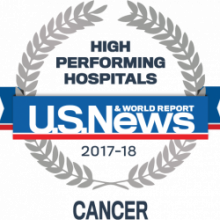 The UF Health Proton Therapy Institute is one of the few proton facilities in the country that have achieved accreditation by the American College of Radiology. It is internationally recognized as a cancer care destination for pediatric radiation oncology patients. The UF Health Breast Center is accredited by the National Accreditation Program for Breast Centers and is the first in the state to offer intraoperative radiation therapy using Intrabeam®. The multidisciplinary teams at the UF Health Cancer Center meet weekly to discuss the details of each patient’s case. This approach leads to a personalized plan created to guide each patient through diagnosis, treatment and recovery. This plan also includes guiding patients who need several different therapies to their ideal cancer treatment combination. The plan is customized for the specific type of cancer, its stage and a patient’s needs and overall health. When a patient begins their journey, a nurse navigator coordinates all aspects of the patient’s care, including ensuring the patient and family understand the care plan.